There's a great piece comparing and contrasting The Passion of the Christ and Last Temptation of Christ over at Slant Magazine. Essentially it's a conversation between Jason Bellamy and Ed Howard who disagree on various issues, in particularly the weightiness of The Passion. It's quite long though so I hope to have time later onto read it in its entirety. Thanks to Ron Reed's Soul Food Movies for the tip off. Way back in 1992 I caught the end of a documentary about Jesus films as part of Channel 4's Easter schedule. At the time I regretted missing the rest of it, and remember being intrigued by Jesus of Montreal. It was the first time I had heard of the film, although it would be eight more years until I finally got to see it. Fourteen years later Channel 4 revisited the subject, broadcasting The Passion, Films, Faith and Fury presented by Robert Beckford and included two excerpts with me. Participating in that documentary got me thinking about trying to track down the older one. The problem was that all I could remember was th subject matter, the approximate year and Jesus of Montreal. I also seemed to recall Baryy Norman's involvement but that seemed to clash with the idea that it was on Channel 4. Eventually I worked out that it must have been Jesus Christ Movie Star from Channel 4 in 1992, but any attempts to get hold of it failed. Then yesterday when Неделковски Ѓорѓи let me know that some wonderful person has posted it up on YouTube. It's in six parts (due to the way YouTube do things) and runs for just short of an hour. There are a couple of bits missing, presumably due to someone not starting the video again after the advert break, but the only major omission is (I presume) the section on Jesus Christ, Superstar, which is ironic given the programme's title. The documentary itself was actually quite good, with interviews with those involved in all of the recent major Jesus films: Max von Sydow, George Stevens Jr., Enrique Irazoqui, David Greene, Lew Grade, Robert Powell, Terry Jones, Martin Scorsese, Willem Dafoe and Denys Arcand. There were also a couple of experts: Harvey Cox (Harvard) and Sheila Johnston (then of The Independent now of The Telegraph) and it was narrated by Ian McShane who has a bit of experience with Bible films himself. For an hour long documentary it covers quite a lot of ground, and there are some real gems in the interviews. It was also apparent that someone had actually worked quite hard on McShane's script. There were a number of fine turns of phrase, perhaps all the more notable because of the relative paucity of well-crafted words in most documentaries today. I was also pleased to see a bit of footage from a film I was not at all familiar with, James B. Sloan's Barabbas from 1935. It prefigures 2001's The Cross and the film about Mohammed The Message with it's use of Point of View shots in order to comply with a ban on showing Jesus on screen. I'm not sure how long this film will remain up for, as it's not on the official Channel 4 YouTube Channel. That's good news for those outside of the UK as they will be able to watch it, but it's possible that 4 might ask for it to be taken down at some point. It is of course well within their rights to do so, but it would be a little churlish if they never intended to make it available in another format, so lets hope not. I've started re-watching the Jesus-as-a-grown-up section of Mary the Mother of Jesus and thought I'd write down a few notes. Locating the transition from Jesus' life as a child to adulthood turned out to be harder than you might expect. Sometimes DVD makers fail to do the most obvious things, and for some reason no-one seems to have thought that it might be a good idea to start a new DVD chapter when we jump from Jesus as a 12 year old to him as an adult. When we do encounter him as an adult he's 30 (as in Luke) and working as a carpenter. After a shot or two with him banging about bits of wood, there's a phony scene of him dealing with a customer who can't afford the service he has just provided. Jesus just smiles. "Pay me when you can". It's not that I struggle to accept that Jesus may have been compassionate with his customers, or even that he let some of them delay payment that gets me. No it's the sense that this customer's failure to mention his financial situation until after the work was done would be received in such a wet-blanket fashion. 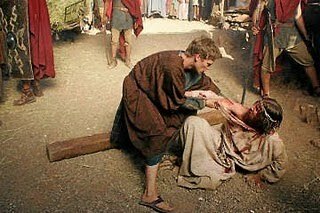 And the filmmakers deciding that of all his years working as a carpenter, this would be the moment to show as if to force the point "hey look Jesus is so compassionate". 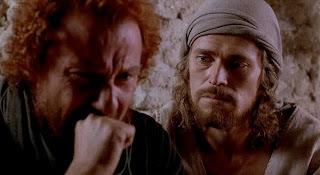 Like Jesus (1999) this initial focus on Jesus as a carpenter is quickly overshadowed by the death of Joseph. Before he dies Joseph croaks to Mary "Jesus: everything he is, you've made him". Whilst the Yoda-esque sentence construction, and Joseph giving Mary all the credit for how Jesus has shaped up are just about forgiveable, Mary's silence and refusal to share the credit is not. I imagine this dialogue was conceived to highlight May's all-round wonderfulness, but it just makes her appear arrogant and uncaring. Not only is Joseph's statement the rising of a last desperate cry of a man fearing his imminent death - which surely calls for reassurance - but it's utterly unrealistic to imagine that a parent could have been with his son for 30 years and had yet no influence whatsoever on his son (no matter who the son in question was). 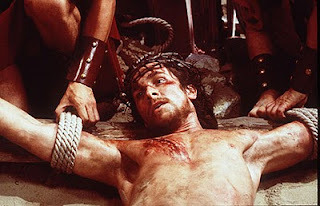 Both films also explore the idea that Joseph's death acts as a trigger for the start of Jesus' ministry. Further, both films contend that Mary's advice is pivotal in helping Jesus realise this. The films were released at more or less exactly the same time so it's unlikely this is the result of copying. That said, the way this film does this is particularly galling: Mary conveniently decides to let Jesus know that he actually has a cousin and fills Jesus in as to his behaviour at the River Jordan. Jesus replies that the reason he went to the temple aged 12 was because he heard God tell him to, and now, through Mary's words he has heard God speak again. So Jesus, along with Mary, goes in search of his cousin, and after hearing his message Jesus decided to take the plunge, but bizarrely Mary then wades into the water to share in the moment. It's a strange moment not because it could not have happened - mother and son being baptised together is eminently reasonable - but because, again, it rings false. The gospels bracket off Jesus' baptism as in some way exceptional. Here Mary is brought, unwarranted, into that bracket, and in a way that is laboured and awkward. Having only made it as far as 10 minutes through I'm going to have to stop, at least for now, partly because it's late and partly because it's already all got a bit too much. Jesus and Mary have just been discussing his plans for saving the world. " Those stories you used to tell" he says, as if incapable of original thought, "that's how I'll teach them..."
Does Anyone Recognise this Film? I am searching for a film I saw at my church in the 1970's. A reel to reel for sure! It depicted God as a gardener sending his son to a colony of ants. 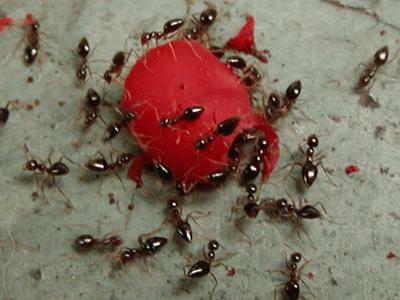 As Christ became an ant, (no dialogue, of course) he was mistreated and ultimately killed. Strange, but very moving, especially for a teenager. I don't think I've ever heard anything about it. Does it ring a bell with anyone else? I've not got much time today but for a while I've been meaning to link to three of Danny Miller's articles on Bible films, one on King of Kings (1961), The Ten Commandments (1956) and a general article on Jesus films. Miller is apparently Jewish, and his write-ups have a nice humorous edge. Just flicking through the latest sale at Play.com and it turns out they have Mary Mother of Jesus for just £1.99 (including delivery!) It's been at least 6 years since I saw that film, during which time star Christian (geddit?) Bale has gone from strength to strength, but as I remember it, it's pretty awful. I'd be interested to revisit it though, if only to see what Bale does with his part. As far as I recall he's actually only third in terms of amount of dialogue / screen time. 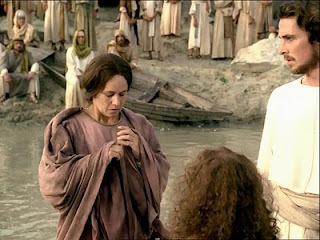 The film's main focus is on Mary and just under half the film focusses, therefore, on Jesus' birth (starring Melinda Kinnaman as a young Mary), which obviously excludes Bale. The larger part of the film stars Pernilla August as Mary so Bale is more of a character in her story than vice versa. As I say, it's been a while since I saw this, so that may all be wrong; as may my distant memory that Kinnaman's section was passable (also featuring David Threlfall as Joseph), but August's part was very poor. There's also one other interesting point of trivia in relation to this film: the same year that this film was released (1999), Pernilla August also starred in another film where she played a young virgin who somehow manages to conceive a son who is expected to be some kind of messiah. That film is somewhat better known, even if it's no more highly regarded - Star Wars: Episode I - The Phantom Menace. Over at Arts and Faith, Steven D. Greydanus has been asking "about father figures in mainstream Hollywood filmmaking". 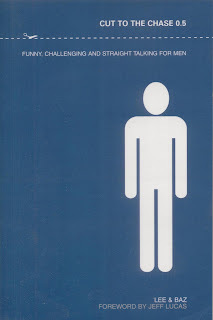 It's a subject I've thought about a few times, particularly in writing my chapter on "Men In Movies" for Cut to the Chase 0.5. So I've contributed a few ideas over there, but, unsurprisingly, I got to think of the depiction of Father's in Bible films. This is interesting to me because the Bible, particularly the Old Testament, is full of spectacularly bad parents. Jacob favours one son so much his brothers sell him into slavery. Jesse thinks David is so unimportant he pretends he doesn't exist when the important man of God comes by. Adam brings his son up so badly that he kills his brother (even without video games). Moses' dad leaves his wife to float him down the river, and Abraham actually tries to kill his son. And don't get me started on Lot. Not exactly a great track record. 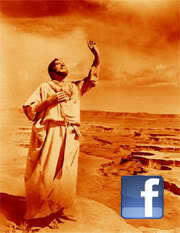 Bible films, on the other hand, are another matter, reflecting not only the original text but also contemporary culture. The first film to spring to mind was the father-son relationship in The Bible Collection's Jesus (pictured). Admittedly the film focuses on the relationship between Joseph and his grown up son, but there is clearly a very strong relationship between the two. 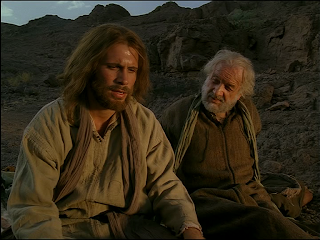 The film's pre-credit sequence shows Joseph comforting Jesus after a nightmare whilst the two are on the road looking for work, and as the credits roll we see a long shot of the two walking across the landscape talking, joking, touching and Joseph passing on his wisdom. It's such a nice shot that I'm surprised I've not noticed it before. The two men work together and there's a good mix of banter, humility and respect displayed in the opening scenes. Joseph's death propels Jesus into pursuing his ministry, but not before his moving, and unanswered, prayers for his heavenly Father to bring back to life his earthly Father. Another Bible film with adult Father to Son relationships is the African film La Genèse. The film, in one sense is about two fathers, Jacob and Hamor, and their wayward sons who trouble them and dishonour their names. The Bible story which most often features a child is the Moses story, though sadly it's not Moses' frequently ignored son Gershom, but the son of the Pharaoh who is fleshed out. There are a variety of approaches here. DeMille's original Ten Commandments depicts the boy as a brat who even kicks Moses so there's very little sympathy when he's wiped out in the tenth plague. This changes a bit in DeMille's 1956 version where Ramsees' care for the boy is one of his redeeming features. The most striking depiction of the Pharaoh and his son is from the silent film L'Exode which depicts the relationship between father and son so positively that you end up wondering which side you are meant to be rooting for. And then, of course, there are the films about Abraham and Lot, none of which really stick out in their portrayal of fathers, save perhaps Sodom and Gomorrah which I watched recently. There Lot is the over bearing father of two adult daughters, but he's one of those fathers who makes strict rules, but spends so little time with his daughters that he really has no idea what they are up to. Perhaps therein lies the lesson. 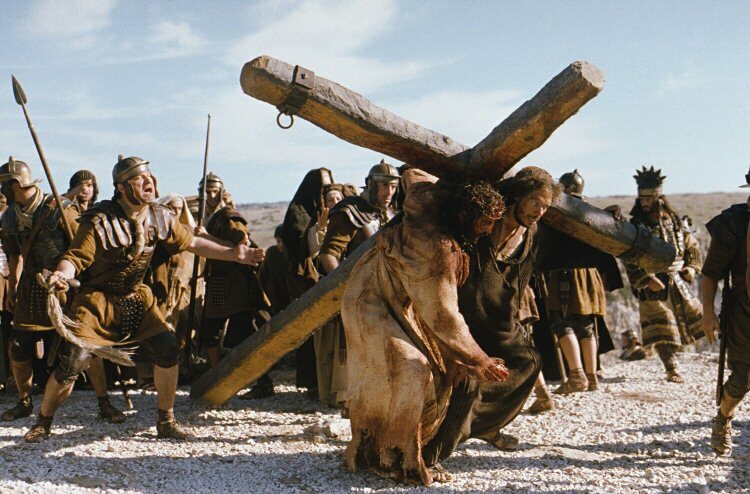 Several years ago I passed on a query from a reader about a film that I thought was Behold the Man (also known as the Westminster Passion Play). I've not really found out much information about it since then, but yesterday I got an email passing on the following query from the Catholic Herald (about halfway down). SIR - Could I make a plea to your readers? I am trying to find a copy of a film which, I think, was made in 1950 called Behold the Man, directed by Walter Rilla. Apart from being shown in cinemas, it was for a number of years also shown on television at Easter. 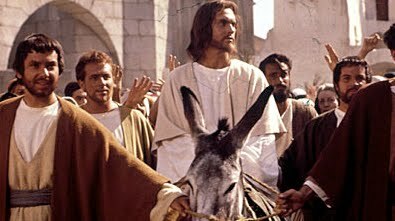 It was the first film on British screens to be allowed, by the exceptional permission of the Lord Chancellor, to show the face of Christ. My mother had the part of Our Lady, and my father, sister, brothers and I also had parts as extras. The part of Christ was played by a Catholic priest. My inquiries to a number of institutions which might have had the film, have been fruitless, hence my appeal to you. If any of your readers know where I could obtain a copy of the film I should be very grateful if they could contact me through your newspaper. Coincidently, I think Miss Bellord's best hope is one of her fellow correspondents Father Peter Malone of SIGNIS author of "Movie Christs and Antichrists". If you have any further information you are probably best passing it on to the Catholic Herald, though I would also be interested to hear about it. As I'm seemingly incapable of staying awake through even a short film these days I finally decided to watch The Ruling Class in several parts. I've actually had the DVD for quite some time now, but had never quite found the time to sit down and watch it. The first thing to say is that I am watching the Optimum UK disc. The film has had a chequered history over here. It took ages to be released, and then, when it finally became available it was only as a severely edited version. This version is the full 154 minutes, and, from the film's opening credits, that the print is the one done by The Criterion Collection. Given that it's currently just a fiver, that's a bit of a bargain. The film's opening shot is of a gavel, and I suspect that this classic courtroom image will be significant. From a narrative point of view it is used to demand silence in order that the 13th Earl of Gurney can make a patriotic speech. It receives a rousing reception, but later, when Gurney is alone, we discover that not all of his theatrics are quite as mainstream, and the Earl accidentally hangs himself dressed in a judges wig and a tutu. It soon emerges that this is something of a family trait. 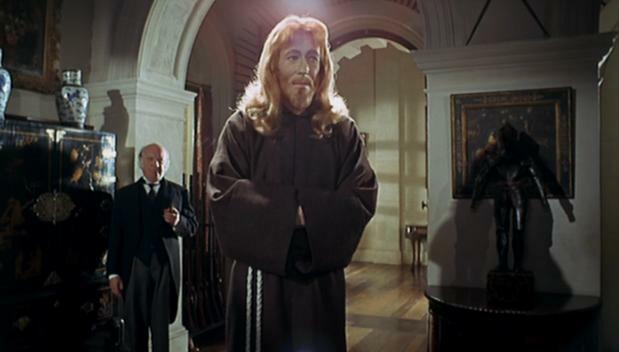 When the now 14th Earl of Gurney (Peter O'Toole) appears on the scene, it is clear that he not only as a strange obsession with execution devices and likes to dress up but that he also thinks he is God. The opening shot of O'Tools (pictured above) nicely shows him with a sort of naturalisitc halo. Needless to say the sane members of the family are not particularly happy that their family name is being inherited by someone so deluded, and so the dead earl's brother hatches a plot to get the 14th Earl to sire the 15th, who will take the place of his insane father with immediate effect. The last few years has seen a considerable amount of debate over the meaning of Jesus' death, but even so it was surprising to see the BBC exploring the issue, let alone in such a fashion that was (largely) content to discuss the subject within a Christian framework. 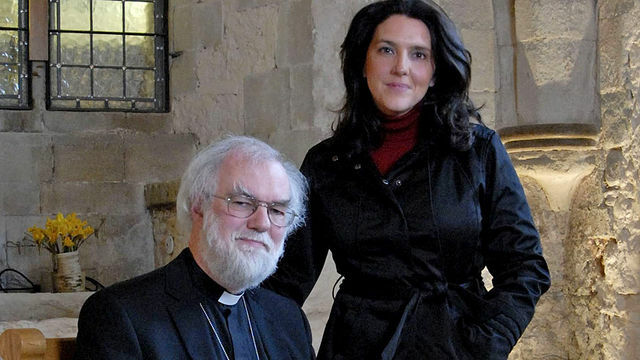 The programme was presented by Bettany Hughes, who recently starred in an episode of Channel 4's The Bible: A History. Hughes was clear about the influence Christianity has had on her and was joined by 4 of the most important figures in the British church - Rowan Williams, John Sentamu, Tom Wright and Vincent Nichols. Each only appeared once, but as part of quite a lengthy interview exploring a single aspect / interpretation of the work of the cross. This gave the documentary a good structure held together with the narrative of how these differing interpretations emerged through history. The opening section of the film, however, relied on scholars outside the church - Jewish expert Dr. Ed Kessler and Muslim cleric Dr. Musharraf Hussain. Kessler and Hussain explained how their faiths view the crofss as shameful rather than something to be celebrated. Having recently become aware of just how frequently the motif of "the shame of the cross" occurs not only in Paul, but in other New Testament writers, it would have been nice to see this angle explored, but that is very much a minor quibble. As it is Kessler and Hussain's comments raise a key question, given that the cross was considered so shameful, why did it become so central to Christian Faith. And so Hughes takes us through the explanations of Pope Gregory and Gregory of Nyssa, of Anselm and Abelard, the reformation and the modern era, ending with a discussion of Moltmann's suffering God. This section was perhaps the film's strongest section: the use of John Sentamu, who suffered under Idi Amin in Uganda, adding poignancy to Moltmann's already moving story. It's also rare to such the work of such a scholar explored in this way. As with all documentaries these days there are a few stylistic quibbles (must the usually learnéd presenters of these programmes always act as if they themselves are on a journey of discovery? ), but overall it was well presented, clearly argued, and nicely illustrated (although I did note some footage reused from other programmes such as The Miracles of Jesus). I've only recently become aware of Hughes' work, but on the basis of the two programmes I've seen and an interview with the BBC on Loose Ends, I have to admit I'm becoming a bit of a fan. There are a couple of other reviews of the programme at Peripatetic Learning and The Convo Blog. I meant to blog about this year's Oberammergau Passion Play at some point before Easter, but as it runs until October then that's probably OK. Meanwhile, Tim Auld of the Daily Telegraph has written quite a long piece on the once-a-decade play which also features a slideshow of images from this year and previous years. 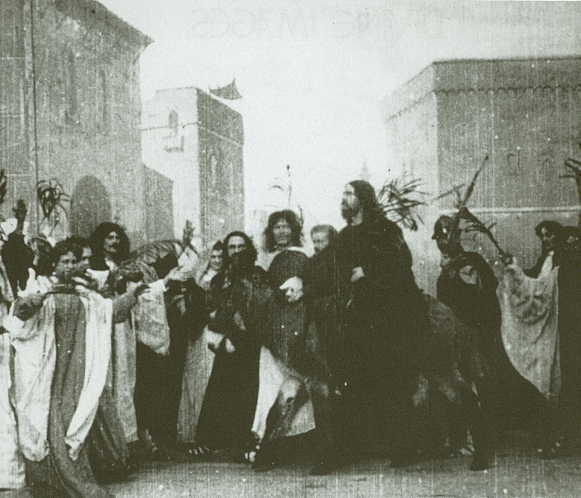 There's no mention of the 1898 film that was named after the play (but not filmed at it - instead it was famously shot on a New York roof top), but as this is the first performance since The Passion of the Christ it's not surprising that much of the article discusses the play's relationship with anti-Semitism (including a photo of Hitler approving of the 1934 production). I've been hoping for some sort of blog post about CBC's new miniseries Ben Hur from Peter Chattaway or Tyler Williams, but sadly nothing has been posted up yet. Furthermore, very few reviews seem to have been posted anywhere else either. The only newspaper reviews I managed to find (in an admittedly brief search) was a preview article from The Globe and the Mail and one from the St. Catherines Standard. Aside from that I could find only one mention of it on a blog from The Legion of Decency (Incidentally there's something decidedly ironic about how those last two reviews relate to the titles of their publication). 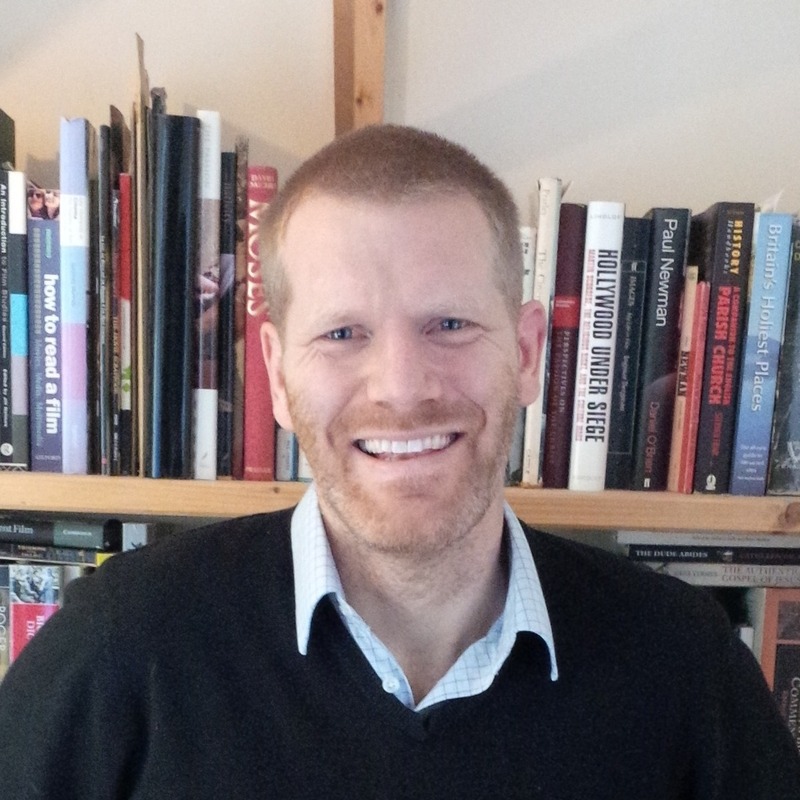 In brief, 'The Globe' thinks it "comes across as a hoity-toity Brit drama", 'The Standard' found that lead actor Joseph Morgan looked "too much like Gavin Crawford of CBC's This Hour Has 22 Minutes" and found the overall programme to be "all right, but just all right", whereas 'The Legion of Decency' called it "crap" and "unwatchable drek". Perhaps not the reviews the filmmakers were hoping for. The Programme concludes this coming Sunday (11th April) on CBC at 8 p.m ET/PT. So it turns out I was wrong about there being no Ben Hur this weekend. CBC has no posted a preview video for those in Canada, and Peter Chattaway has linked to two articles interviewing some of the actors. I imagine that Peter will post his thoughts on part 1, which airs tonight, fairly soon. On Wednesday I linked to some recent pieces on The Passion of the Christ by Juliette Harrisson and Alfonso Méndiz, and now The Guardian's Alex von Tunzelmann has posted her own views on the film. Despite the similarity in subject of von Tunzelmann's Reel History to Pop Classics, the two writers come to opposite conclusions on the film, which is kind of fitting given that it has always provoked similarly strong and yet similarly divided opinions. Interestingly one of the things von Tunzelmann dicusses is how Satan's costume makes her look like a Jedi. I'm reminded of the post I made back in September 2007 that noted other similarities betwen this film and Return of the Jedi. As with other years I've had a quick look through the TV schedules for the holiday period and picked out the programmes that might be of interest to readers of this site. (incidentally you can see other festive seasons' religious programming all together or individually - Easter '09, '08 and '07; Christmas '09 '08, '07 and '06). This years seems to be a particularly good year for biblical epics and people who respect Rowan Williams (pictured). The only downside is that there's not much rare or original programming, but given that both the BBC and Channel 4 have offered us major series on Christianity already this year, and that only last week the BBC screened a rare Bible film, this is perhaps fair enough. Interweaving the fictional story of Marcellus' spiritual death and resurrection with that of the physical death of Jesus, The Robe is arguably one of the more apt Jesus Cameo films to broadcast on Good Friday. Richard Burton and Victor Mature are both a little hammy in places, but the Good Friday scenes are moving and impressive, and it's another chance to celebrate the life of Jean Simmons who died earlier this year. I know there are plenty of holes to pick with this film, but somehow I still find that I love it and long to watch it again. King of Kings turns 50 next year and whilst parts of it show its age, other parts still hold up remarkably well. It's been a while since this was last shown on our TV screens so it's nice to see it make a comeback. Suffice to say if I was to get a chance to choose a Jesus film to watch on the big screen, this would be one of the two I'd go for. As with last Easter, so Channel 4 are showing The Greatest Story Ever Told although not in the the very fitting timeslot it had last year. Still, if you have a spare three hours, and you can get past the distracting cameos, and the odd ridiculous moment (that's you Heston) there's much to enjoy. And on top of this you can also catch the entire series of Diarmaid MacCulloch's excellent A History of Christianity on BBC4, and Jesus Christ, Superstar on ITV3. Dr Williams has heartily endorsed MacCulloch's work; Goodacre Jewison's.